0% APR Financing with Klarna. Pay over 6, 12 or 24 months. It's Safe, Secure, and Easy to finance your Nolah with Klarna. We're happy to offer our customers a flexible 0% APR financing option to pay over time for their Nolah mattress. The payments can be spread across 6, 12 or 24 months and can be paid in full anytime during the period. As this offer has 0% APR, it can't be combined with any promotion codes, coupons, or other offers. Nolah Sleep will ship your order and send you a confirmation email with tracking information. Klarna will stay in touch and remind you of upcoming payments. Payments are managed at Klarna.com. *Promotional offer for qualifying customers. Non-promotional purchases with Klarna have a 19.99% APR and are subject to a $2 minimum interest charge. 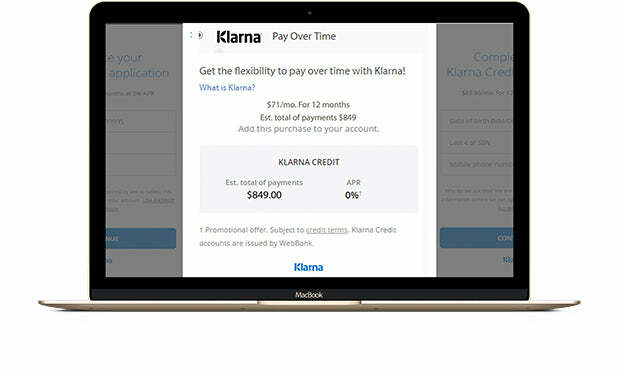 Klarna Credit accounts are subject to credit approval and issued by WebBank.